In “Repairman,” the Sleestak once again hatch a strategy to eradicate the Marshalls, and once again seize upon the notion of tampering with the Sun. 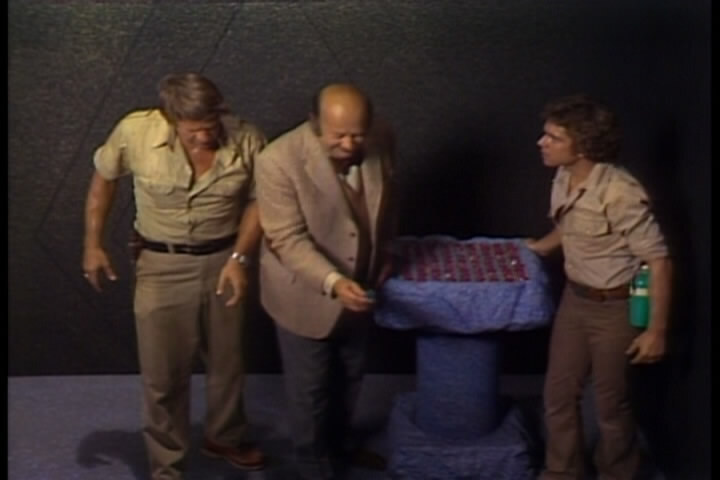 Using another heretofore unknown pylon -- a black one at that -- the Sleestak remove a vital “sun crystal” from the matrix table. As a consequence, solar flares erupt, threatening to burn-up and destroy all life in the Altrusian valley. Of course, there are a couple of problems with this plan. The Sleestak have tampered with the sun and daylight before. In fact they did so in the previous episode, “The Orb,” so you’d think they might have learned their lesson. Apparently not. 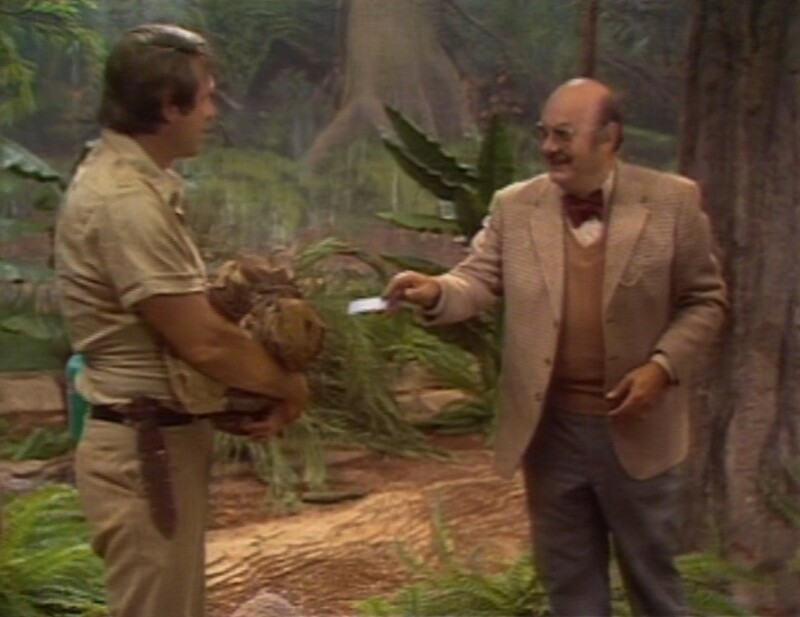 And secondly, it makes no sense that the Sleestak in the third season have become veritably obsessed with killing the Marshalls…to the exclusion of all other concerns. On more than one occasion in the previous two seasons, the Marshalls came to the Sleestaks’ aid, and yet this fact is never acknowledged. Suddenly the Sleestak are out-and-out bad guys, with little moral depth, and all they want to do is to kill the Marshalls. The important subtext of the series – of cooperating with your neighbor – for the good of the environment or planet, is utterly lost. After the solar flares erupt, a fastidious, unflappable “dandy” type named Blandings materializes in the Land of the Lost. 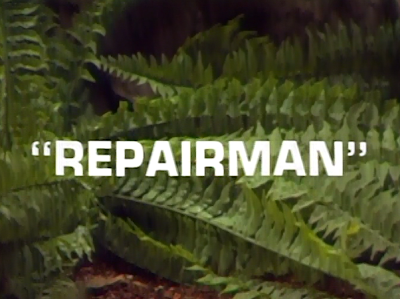 He reports that he is a “repairman” of sorts, and has a few short hours in which to stop the solar flares. “Duty is duty,” he notes cheerily. After Blandings returns the sun crystal back to the black pylon matrix disappears, he disappears…but not before revealing to Holly that the Marshalls will, one day, find a way home. Again, if you’ve watched Land of the Lost, or even just kept up with my retrospectives here on the blog, you’ll realize the central problem with “Repairman.” Basically, the Land of the Lost’s environmental control mechanisms have malfunctioned many times before (in “One of Our Pylons is Missing,” “The Longest Day,” and “Blackout” to name three occasions), but never before has a repairman appeared to fix them. 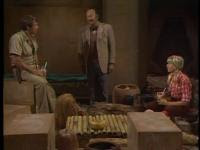 Instead, The Marshalls have had to act decisively, often cooperating with Sleestak or Pakuni, to repair the damage themselves. I submit that this is a superior story paradigm, as it makes the Marshalls co-stewards of their environment. Having a repairman show up to fix things in a jiffy isn’t nearly so dramatic a resolution, and the characters don’t seem to learn much from his presence, either. In “Repairman,” the Marshalls must rescue Blandings from Sleestaks in the Lost City’s pit (as Will had to rescue Enik and Chaka in last week’s “The Orb”), but they are bystanders to the repair process, and thus cut out of the action. Also, Blanding’s revelation that the Marshalls will find a way home seems misplaced, given series lore. We already know that a future version of Holly has warned her that she will one day be left alone in the Land of the Lost, without her family’s companionship. We have already seen Rick Marshall leave, albeit unintentionally, thus fulfilling a part of that destiny. It seems odd that given the future we already know about, that Blandings would state something directly to the contrary. And, finally, I must note once more that Holly (Kathy Coleman) is given virtually nothing to do in this installment. She disappears for long stretches of the tale, and is not given the opportunity to join Jack (Ron Harper) and Will (Wesley Eure) on their rescue attempt. Next week’s episode, “Medusa,” is a more Holly-centric segment and perhaps one of the finer episodes in the third season catalog. John, good review of another episode of the troubled season three. Holly gets sidelined again.